Arguably one of the most scenic areas in the country, the hamlet of Balnakeil sits less than a mile from Durness, Sutherland a popular tourist destination on the north coast of Scotland. Centuries old and surrounded by medieval ruins, Balnakeil Farm is recognised internationally for the variety and quality of habitats and geological features it supports. The owner, Andrew Elliot is highly regarded for his North Country Cheviots and easy calving Aberdeen Angus, but what most people don’t realise is that it’s Andrew’s low-intensity farming practices that have fostered an impressive amount biodiversity, and that his farm actually provides a home to some of rarest species of plants, animals and insects in the country. 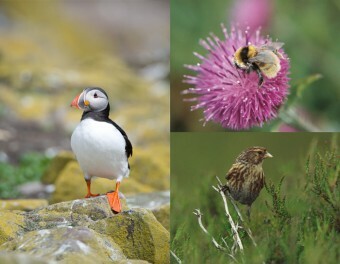 Balnakeil Farm supports priority habitats like dune grasslands and limestone pavements, with coastal grasslands which grade into heathland communities on the Balnakeil headland. Mountain avens (Dryas octopetala) occur amongst the limestone outcrops. This rare upland community at Durness provides one of the best examples of Dryas heath in Britain. The farm is also rich in birdlife throughout the year, in particular many scarce or declining species such as corncrake, twite and barnacle geese, that come to roost and feed on its natural and improved grasslands. In fact, Durness is the only place on the UK mainland where corncrakes have an unbroken record of returning to breed annually. Thanks to traditional management practices that encourage wildflower growth, the farm has also helped to conserve the remnant population of the great yellow bumblebee. Even puffins and otters come to forage and breed at Balnakeil Bay. 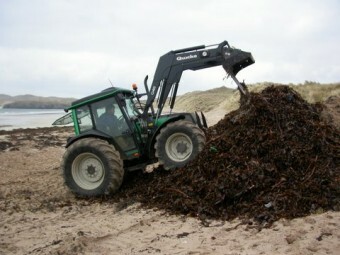 Balnakeil Farm suffers from poor local infrastructure leaving it isolated from markets. The farm’s size and coastal location also means that Andrew Elliot faces a challenging climate and hard, labour intensive work that is not attractive to the next generation farmers or tenants. The lack of profit to re-invest in capital projects makes it that much more difficult for Andrew to continue with traditional farming practices and maintain the infrastructure that is vital to support the important habitats and biodiversity that exist at Balnakeil. The agricultural area around Durness is witnessing change—a loss of traditional rotations, reversion to natural scrub succession on some areas of ungrazed hill ground and threats of afforestation as an alternative land use. These changes can impact on the biodiversity in the area. Therefore the long term viability for farming and rural communities in this area must depend on receiving adequate support to ensure these low intensity farming systems can continue. The Elliot family has farmed at Balnakeil Farm since 1908. The current owner, Andrew Elliot, is a full time, hands on farmer who also manages two other farms on the borders. He has managed the farm at Balnakeil as a traditional livestock unit for the past 21 years, employing 1.5 full-time employees to work the 1500ha. 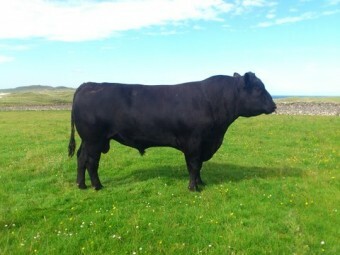 Andrew keeps a herd of 45 Aberdeen Angus cows and 600 North Country Cheviots ewes. 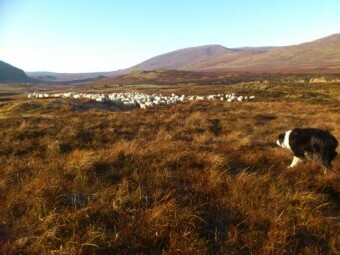 The sheep are sold at market, whilst the cattle taken to the home farm on the borders to finish. Maintaing a quality environment rich in wildlife is important to Andrew as it underpins his farm business diversification, sharing the farm experience with others though his holiday cottages lets (www.elliothouses.co.uk). Moving towards greater self-sufficiency in terms of food production is what Andrew thinks each country should aim towards to maintain their core primary industry. He also feels there should be tougher consequences for non-compliance, more encouragement to invest in infrastructure (particularly for tenants) and an improvement in funding schemes. Stone collecting (G Fletcher), Corncrake (Andy Hay—RSPB Images).